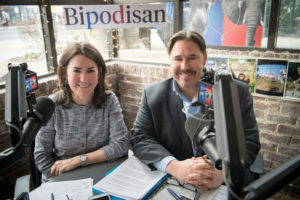 Chris Lu (Mary Kate’s fellow Senior Fellow at the Miller Center and a big cheese in the Obama Administration) joins Bipodisan this week in a special Hurricane edition from Chatter Bar. The two analyze the President’s “A++” and “unsung success” tweets, his remarks on 9/11, and their four-legged tip for personalizing the First Family. Then the two interview Elise Bean and Justin Rood of the bipartisan Oversight Boot Camp on Capitol Hill, which trains staffers from both parties in both the House and Senate to run committee investigations to be something other than Partisan Witch Hunts between the two parties. Plus, the bromance between 44 and Senator Coburn, happy hours for staffers, and fake scandals.